We got this one from a friend and was labelled as red mushroom. Despite growing more as a bell shape it had such a great sweet mild flavour we decided to share it and call it a red mushroom variant. 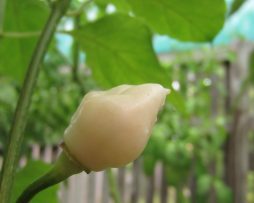 Again another hardy easy maintenance one that pumps out hundreds of cute bell shaped pods that taste sensational. Grows quite compact and bushy with pod size 3-4cm wide x 3-4cm long. Sweet and crispy these go great in salads or for making an awesome mild salsa. We also think they would make a great base for a sweet chilli sauce. This chilli pepper is both good to admire for its ornamental value and also to eat. 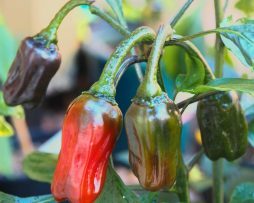 It is similar to a red Jalepeno in heat, flavour and aroma. 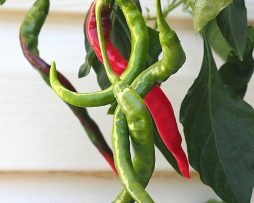 Said to have originated in Turkey this is another must for your chilli pepper garden. 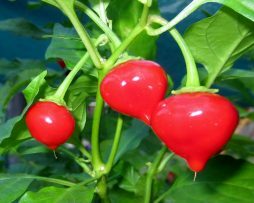 It is a great one to grow in pots and is a nice study plant with pods ripening from white to a deep red. 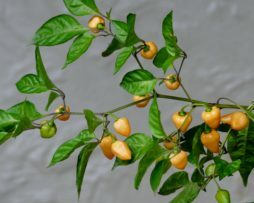 The Royal Gold chilli is a native of Peru and produces quite a lot of pods for a bush that is not very big! If that’s not enough, the fruit is sweet and hot and has a hint of passion fruit or apricot flavour! These are great for salsa and salad. Royal Gold would also make a really good powder. A very good chilli! The Salmon pepper is a very versatile one indeed! It gets its name from the wonderful salmon colour it turns before it matures to a lovely red. 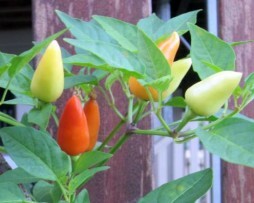 A high yielding bush with good sized pods, it is about the same heat as a Serrano. Perfect for everyday cooking and thinly sliced for Asian soups and stir fries. Another great all- rounder! What a nice surprise the Santa Rosa Blanco is! It is originally from Peru and is a very prolific producer of perfect little pods. They start out a glossy white and turn a beautiful shiny red when ripe. They also happen to taste great! It’s sweet and fruity but still has a hot bite. These are terrific to eat and great as an ornamental too. We know you will be pleasantly surprised with this one! 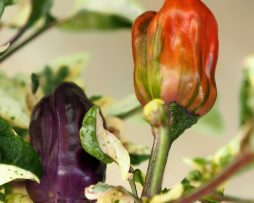 The Scarlett chilli is an unstable cross between a Purple Tiger and a Jalapeno that we got from a friend. We grew the seeds and got two varieties one with variegated foliage and this one which turned out just as special. There’s a chance you will get the other stunning variegated version but if you do you will NOT be disappointed – it’s beautiful. This version has downward growing pods 6cm long and 2cms wide that start off black and transition to a bright red. We don’t sell many varieties that haven’t proven themselves stable but this is one of the special exceptions. 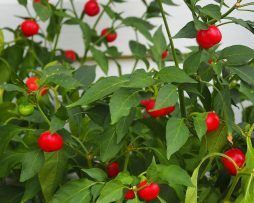 The plant itself grows to less than a meter and the taste is sweet and remnant of the Jalapeno flavour. Even if yours doesn’t grow quite like ours we almost guarantee you will love the unpredictable results. Sometimes the fun of growing is in the surprises we get. Not a lot is known about this little chilli, simply known as Snow White. 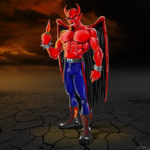 We do know that it has been around for a few years and is a Habanero type. It also seems to originate in Brazil. It is very prolific and is a very attractive plant when covered in pods! The taste is good. Sweet and crunchy with a bit of heat, it goes great in a Salsa or Salad. 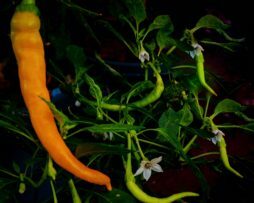 If you love your white chillies, this is a good one! The Solar Flare is out of this world for size and colour. It’s become one of our favourite Space Chillies. With its neon yellow fruit growing up to 20cms long it’s a real stand out in the garden. It has a medium fleshed wall that is juicy and sweet but not screaming hot, making it a good all rounder in the kitchen. 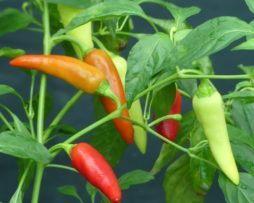 If you’ve grown the other Space Chilli Varieties you just simply have to add this to your collection. 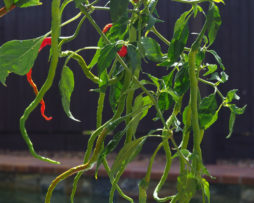 Growing to an amazing 30 plus centimeters long the Spaghetti Chilli is sure to impress. Incredibly thin also, the Spaghetti chilli is very similar to the Thunder Mountain Longhorn, but way more productive and easy maintenance. Very mild as chillies go this variety is thin walled and easy drying for later use. With a peppery nutty flavour they are on our permanent hit list and will be in our garden for years to come. You won’t be disappointed with this one. Oh how we love the Space Chillies and this one is no exception. Again as for all the Space Chillies it’s just the most prolific producer of pods you can get. The fruit grow up to 10cms in length and are a bit twisty in shape. Ripening to a bright red they taste great and are sweet and crunchy with a very mild level of heat. Yummy yummy get this in your tummy. The beautiful TANGERINE DREAM. Besides having an awesome name this variety is crazy good if you like your chillies easy growing and not too hot. 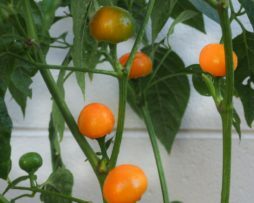 The Tangerine Dream fruit turn a gorgeous orange colour when ripe and grow to a size of about 3.5cms x 2cms. They grow upright and are prolific on the bush. They have a thick juicy flesh and taste like sunshine. But seriously they have a smooth sweetness with a hint of orange citrus flavour. There is another chilli named Tangerine Dream floating around but this ones from our friends at Sea Spring Seeds who got seeds sent to them by a mysterious stranger in Italy.